I once challenged my husband (then boyfriend) to a food contest. We were planning a dinner and I told him that we both should come up with our own menu and get my Mom to judge which was better. He had very simple tastes (then) and I since I would pour over food magazines during my spare time – it was a no brainer who would win. I can’t even remember what his menu was (nor could I remember mine) – but I do remember how excited he seemed and how serious he was taking the challenge. I took one look at his “entry” and in a moment of kindness I decided that I would let him win. I liked that he tried hard and was I excited to see him passionate about food (for once). When he wasn’t looking I snuck to where my Mom was and told her that we were having a competition on who could make a better menu and whatever happened – to please say that he had a better menu. I regret doing this now. He has never let me forget that he won the menu challenge. No matter how many times I tell him it was rigged, he insists that he won. To this day we have these menu competitions. The last one was about a month ago when we had dinner at Duke’s Bistro in Darlinghurst. One dish we shared were these slow cooked beef ribs with mustard sauce, daikon and some shiso served with mandarin pancakes – like how you would serve peking duck. We both loved the idea of the pancakes and thought wrapping something other than peking duck was genius. “Can you come up with something better?” He asked. “Challenge accepted.” I told him. Can you guess whose idea the roast pork belly was? This is the first part of two. The dish is served with some Mandarin pancakes, spring onions, and cucumbers. I’ve used sriracha sauce although a spicy Chinese mustard sauce would also work well. The secret to the crispy skin is to make sure it is completely dry before roasting. To ensure the meat is moist, roasting over a pan of water does the trick. I’ll post the Mandarin Pancake recipe next. Score the pork belly lengthways (or ask your butcher to score the skin for you). Place the pork belly skin side up, on a plate and on top of the kitchen sink. Boil around three cups of water and pour this over the pork belly. Pat the pork belly dry and place on a plate in the refrigerator for an hour or two. In the meantime, prepare the paste by mixing the salt, five spice, garlic and caster sugar – using a mortar and pestle or food processor until the mixture resembles a rich dark brown paste. Once the pork is ready, place this on a chopping board, skin side down, and cut through the flesh, making sure not to cut through the skin. You will need to rub the spice paste all over the flesh, including the crevices and sides. Make sure not to rub any paste on the skin. Place the pork belly on a rack and place this back into the refrigerator to allow the skin to dry, at least four hours, or overnight. To cook the meat, remove the pork belly from the refrigerator. Bring the oven to 220 c (fan forced). Fill a deep baking tray around half way with water and place a wire rack over this. This will keep the pork flesh moist while the skin crisps up. Place the tray and rack in the oven and put the pork belly (skin side up) on top of the rack. Roast the pork for 20 minutes at this temperature and then drop the temperature to 180 c for 30 minutes. Finally, take the temperature up to 230 c for 15 minutes. Remove the pork from the oven and rest for around 10 minutes. Cut into serving pieces and serve with Mandarin pancakes. This recipe was awesome! I just took it out of the oven and it’s amazing! One thing though, after the cooking time the skin still was soft and pink so we placed it under the broiler on low heat for the last 15 minutes and the skin is super crispy now and the meat moist! Thanks for this great recipe. 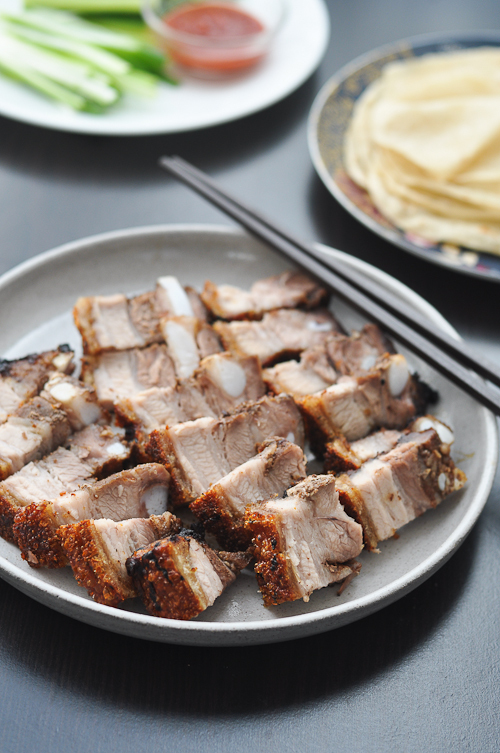 Your pork belly looks delicious and will be a terrific addition to my favorite ramen recipe. The crispy rind and succulent meat leaves more than a delicious biting memory. This is one of my favourite recipes. Thanks for sharing Trissa. Brilliant idea! You’re just brimming with them! I just happen to have some Chinese roast pork at home too.. Your pork looks perfect – love those delicious cartiliagey soft bones in there too. Yum! Is it really that easy? I tried making this once but the skin wasn’t crispy at all. I’d love to try it again with your recipe 🙂 It looks really quite mad! You never fail to have a story to tell, Trissa :). Though not quite a big fan of roast pork, I have to agree that this would work beautifully with the wrapper. P.S: still trying to get used to this ‘swipe’ format for iPad. I wish I had a husband who would cook once in a while…never mind do a challenge! The next best thing though, is he doesn’t hesitate to feed me well because we eat out at least 4 times a week. 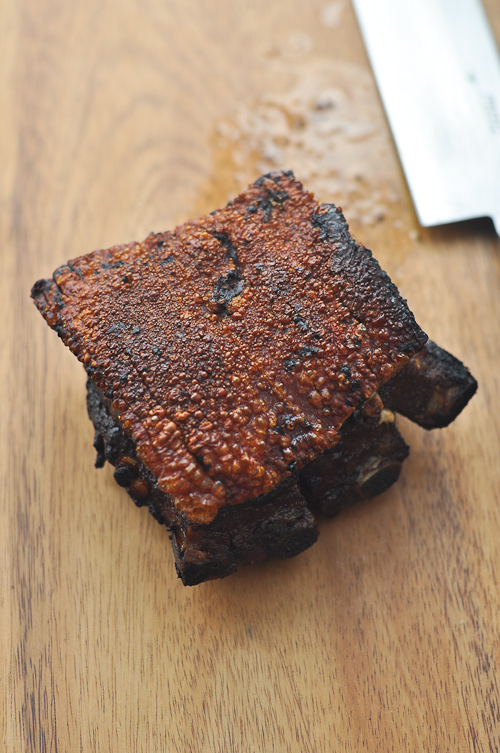 My favourite cut for roast pork is the belly and of that, the crispy skin is to die for! Looks kind of difficult to make but you did a marvelous job! Yum! I really love the look of the crispy pork belly! my mom always gets this from the local asian supermarket when i go home and it always seemed so hard to make. thanks for posting the recipe. love your photos. Lol you guys are too cute! I don’t eat pork, but these look delicious and love the idea of serving other things in the pancakes. this is my all time favourite dish, I could never master the crisp skin that crackles upon first bite. interesting to serve it with chinese rice pancakes that we use for Peking duck! would slather on lots of mustard! I love the add of the mandarin pancake. The pork looks great. Genius! I made some roast pork belly last week too, too bad I didn’t serve it the ‘Peking Pork’ way. Looks so good! I’ve been dying to try pork belly at home, Trissa! I adore the presentation with the pancakes. Fess up. Whose ideas was it? Yours, I hope. You can’t let we foodies down! That looks amazing! My mouth is watering already! Looks gorgeous. 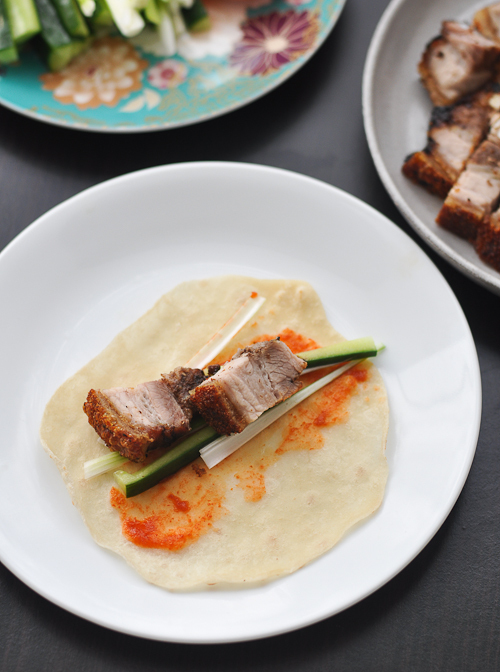 I love roast pork belly and I love things that you can wrap together and eat! LOL.. you guys are too funny! This is very similar to the process I use to cook pork belly although usually I cook it in wine and water. Your photos are breathtaking. Sounds like you two have so much fun and your pork pictures are so enticing. I’ve had a pork belly recipe in my purse for days and days, hoping that I’d finally have the time to make it. I’m hoping this week will be it but that remains to be seen. Until then, I’ll linger here to drool over the crispy skin and tender meat. Great idea to serve them with pancakes as I gave up rice for Lent. oh my goodness YUMMMMMMM! your roast pork looks fantastic trissa!!! I think your husband is my husband’s lost twin! Crisp spicy pork is culinary heaven on earth in my book. You win every time. Perfectly Roasted pork belly!! I’d eat it with lots of rice! Winner!!! 🙂 I’d be in cholesterol heaven with several rolls of this one! You should try the wrap with lechon + lechon liver sauce! It’s been a hit here and dunno who started the concept but I’ve attended a lot of parties with the centerpiece lechon served 2-ways (carving and wrap). I always said I would be vegetarian so long as I could eat pork. This just confirms my theory.